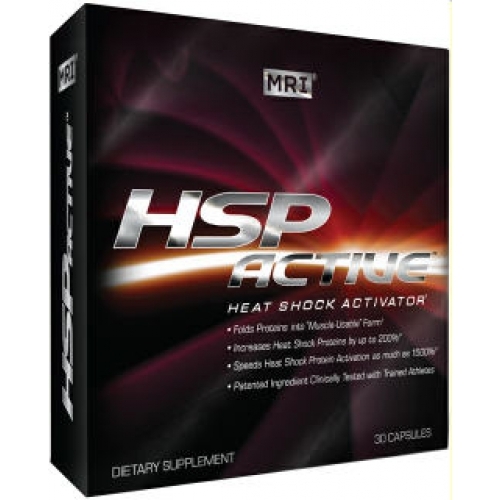 MRI HSP Active Heat Shock Activator are the long-missing key to unlocking new muscle production. In fact, HSP Active is the first product to seriously focus on creating a clinically tested product that targets HSPs. Unlike dietary proteins such as whey or chicken, HSPs are naturally occurring functional proteins involved in protein synthesis and the building of new muscle. HSPs support muscle protection, repair, and growth from theâ€œinside out.â€ By focusing on the cellular structure that works in synthesizing proteins, we are able to help the body respond more effectively to a stressor (such as an intense workout). Letâ€™s start with what Heat Shock Proteins are not: dietary proteins. Most bodybuilders hear the word â€œproteinâ€ and visions of whey packets, tuna cans, and hard boiled eggs (whites only, please) instantly pop up. HSPs are not food. In building new muscle, your body employs three types of proteins: dietary, structural and functional. HSPs are functional. It is the interaction between the three that get you bigger and stronger. The higher degree of interplay, the faster you get the results you want. And itâ€™s important that you see how they work together, and know what you can do to maximize their muscle-building effect. * Dietary Protein â€“ Building blocks of muscle: Your body breaks down dietary proteins into amino acids. After a complex chain of events (I lay them out below) they get reassembled into actual muscle protein. * Functional Protein â€“ Muscle-building workforce: The name gives it away. These proteins serve a function not only in building new muscle, but in sustaining life itself. Some examples of these proteins are enzymes, cell-signaling proteins, and HSPs! Unlike their â€œsexyâ€ structural counterparts, you cannot see them. But they keep that highly complex machine â€“ called you â€“ functioning at peak levels. Every micro second, functional proteins blast out millions of signals to your brain, heart, muscles. Heat Shock Protein (HSP) activation may be the biggest breakthrough in the history of training. HSPs â€œfoldâ€ proteins into â€œmuscle-usableâ€ form. They rapidly repair training-damaged muscle fiber and may help increas:" ":e only heat shock activator that the MRI scientists found that elevates HSPs by 200% and speeds their time-to-action by 1500%. The greater amount of HSPs you can activate, the more lean mass and strength you may be able to gain. Tex-OEÂ®, the patented ingredient in MRIâ€™s HSP Active, has been shown to increase the level of HSPs by a staggering 200% over exercise alone. The faster heat shock proteins start working, the less damage, greater repair, and faster muscle growth you may be able to experience. Tex-OE, the patented ingredient in HSP Active, starts activating HSPs as early as 6 minutes as opposed to 90 minutes. Thatâ€™s up to 1500% faster than exercise alone! HSP Active keeps HSPs activated for up to 72 full hours. So you get the benefit of increased HSP activity before, during and after your training! With HSP Active, youâ€™ll feel the heat and experience the shock! You train extremely hard to get the results you want. It takes immense dedication, relentless willpower, and unimaginable sacrifice. Now see the perfect harmony that exists between you and your HSPs in achieving those results. Discover the extraordinary interplay of â€œstressâ€ and â€œadaptation.â€ Itâ€™s the ultimate evolutionary partnership. The first job of the HSPs is to start clearing out the â€œdead weightâ€ proteins. Youâ€™ll recall theyâ€™re taking up the space inside your muscle cells where strength producing proteins should occupy. And remember, HSPs also ignite protein synthesis for the purpose of replacing those damaged proteins with new, healthy ones. Days 1 through 3 is also the time when HSPs start repairing damaged cells. In addition, these first few days are when HSPs start interacting with muscle cells to protect them against the onslaught of your intense workouts. * The kind that you need to work longer and harder. * The kind your body needs to carry out all the metabolic activity. And with all the increased HSP activity going on, your body will demand more. Youâ€™ll know this because your body will send out hunger signals. Obey them! With damaged proteins under repair, and the cell protection mechanisms in place, the HSPs can now turn their attention to making new proteins with the purpose of growth. Even though you may not notice it in the mirror yet, inside your muscle cells â€“ the game of growth is on! Remember, emerging scientific research in laboratory animals demonstrates that HSPs increase the protein density of cells by up to 18%! Right around this time, you might begin to notice that you start sweating very soon into your workouts. We called it the â€œHSP Sweats.â€ Everybody is different â€“ and you may not notice the â€œsweatsâ€ for some time. And at this point, you might notice a gain in weight. Itâ€™s during these days that one athlete reported he was pushing more weight. And it happened fast. It seemed like each new workout he could pile on additional weight! And that plays right into the strength of HSPs! Remember, with HSPs, the harder you train, the harder they work! Mannitol Gelatin Silica Magnesium Stearate Water Titanium Dioxide. On training days dose 1 1/2 to 2 hours prior to your workout. 1. Take at night at least 2 hours after your last meal. Not for use by people under the age of 18. Keep the product out of the reach of children. As with any supplement consult your healthcare professional prior to use if you have or suspect a medical condition are taking prescription drugs or are pregnant of lactating. Does not contain stimulants or caffeine. Keep out of reach of children.